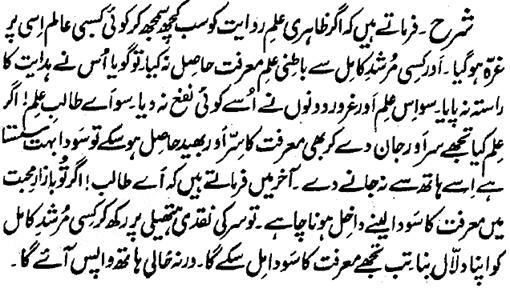 Hazrat Sultan Bahu Rahmatu-Allahe Ta-aala Alaihe says that if a professional Aalim considered the Ilm-of-Outward (Outwardly Ilm) of Dictum as everything as cocksure and he did not acquire the Inwardly Ilm of Marifat from some Murshid-e-Kaamil, then it is as if he has not found the Course of Hidayat. Hence, this Ilm and such pride gave him no profit. Therefore, O Seeker of Ilm! The transaction of getting the Sirr and Secret of the Marifat in lieu of all Ilm, head and life would be still very much inexpensive. Let this opportunity not go wasted. At the end, he says that O Seeker! If you decide to enter the Bazaar of Muhabbat to purchase the stuff of Marifat, you should keep the cash of your head on your palm and make some Murshid-e-Kaamil the broker. Then you will get the stuff of Marifat. Otherwise, you will return empty-handed.